What comes to mind when you see the word "bisque"? If your brain took you to a bowl of thick French soup laced with so much cream you could feel the calories on your hips, you'd be headed in the right direction. 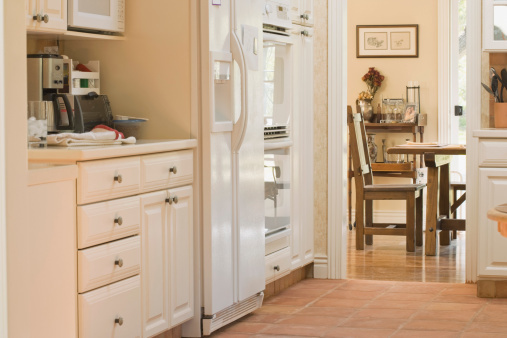 Bisque appliances have been in and out of vogue for decades. Regardless of varying opinions, there will always be fans craving a kitchen full of the warm pinkish-brown color. If you've got bisque appliances, consider the following tips to turn your kitchen from not-so-bad to downright gorgeous. Showcase the warmth of your bisque-colored appliances by opting for rich, brown cabinets and patterned granite counter tops that incorporate shades of brown, pink and taupe. 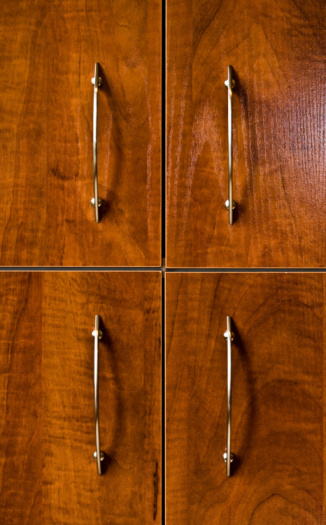 Glaze your cabinet fronts for an extra touch of luster. Choose chocolate linens to achieve an elegant pairing with your bisque appliances. And for a final touch of sophistication, have your tea towels monogrammed with your initials using bisque-colored thread. Go for high contrast rather than complementary hues to make your bisque appliances an integral part of the room's color scheme. Paint or refurbish woodwork a rich cherry color and replace worn counter tops with teal soapstone. Accessorize your kitchen with teal-print kitchen curtains and a solid teal floor mat. Choose wall art and linens to bring out the cherry, bisque and teal color scheme. Soften the look of a small kitchen by making bisque the darkest color in the room. Paint cabinet fronts white or replace some of them with glass to add a touch of French country. Make it your mission to find the best shade of white for your room by consulting paint swatches and color-matching books so your bisque appliances look right at home amid the white. Take this wise tip from decorators: study the white you've picked both in the light of day and in the evening so you don't wind up repainting. Disguise the color differences in your kitchen appliances (no two companies produce exactly the same tone of bisque when they manufacture product) by choosing a bright color to dominate the room and draw the eye away from what may appear to be a lack of appliance color coordination. Muted green wallpaper or paint, light green tile flooring, and curtains splashed with bisque, pink and beige flowers can pull a room together to diminish the impact of various shades of bisque in your appliance selections. Make your bisque appliances the focal point of your kitchen by re-vamping the entire room in black and white. Choose black granite counter tops. Distress and glaze cabinet fronts so they appear to be white with a hint of gray grain. Tone down the floor by using cool gray tiles. Display vividly colored art such as a gathering of water pitchers, small lithographs framed in black, and collector plates that rely upon black, white and bisque (skin tones) to accentuate the room's three main colors.